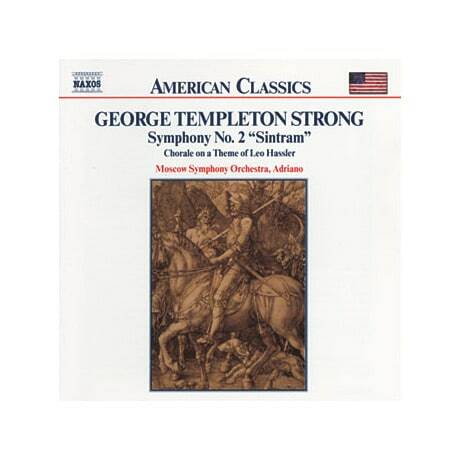 Although his career was spent chiefly in Europe, George Templeton Strong (18561948) always considered himself an American composer. This recording presents two of his best-known works. A brilliantly scored masterpiece, his 188788 Symphony no. 2 in G Minor, op. 50, was inspired by Friedrich de la Motte Fouqué's romance Sintram and His Companions and by Albrecht Dürer's famous drawing Ritter, Tod und Teufel ("The Knight, Death and the Devil"). Fouqué's tale revolves around Bjorn, a cruel Norse knight of unbridled temper, and his son Sintram, whose life is blighted by a curse arising from his father's misdeeds. Strong's immensely moving Chorale on a Theme by Hans Leo Hassler was first performed by the Paris Orchestra of St Pierre-Fusterie under Louis Durey in 1933 and was later conducted by Ernest Ansermet in Geneva. In Strong's instrumentation, Hassler's 1601 chorale Wenn ich einmal soll scheiden ("When the Last Hour Comes") moves with serene beauty from Adagio to Lento molto e tranquillo.